photo taken seconds after picture #3145 was taken. It shows the crew had brought extra hoseπtch the ladder to the skip to control&extinguish the fire completely. Nice birds i view. I bet someone set this skip on fire purposely. Added by Fozaib Khan on 11 January 2008. 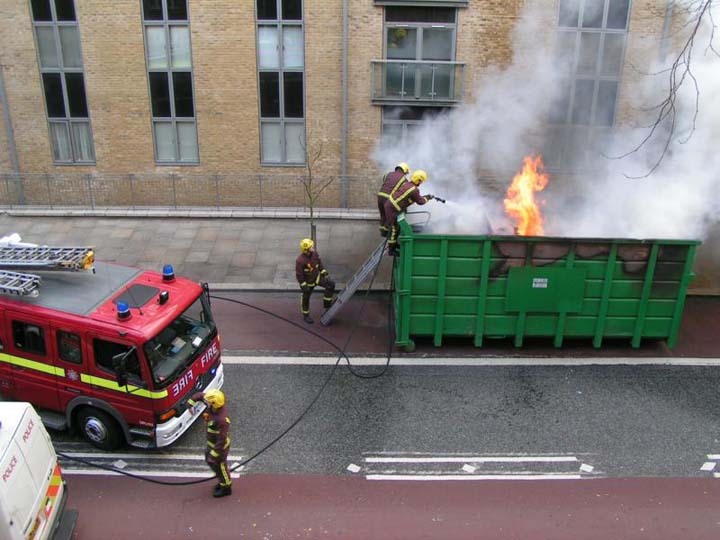 Aah, the classic "Dumpster Fire". A lot of Fire Dept's keep a smaller-diameter pre-connected Attack Hose, on the Pumper, for this purpose. Frequently, piped and stowed in the ample front bumper. Sometimes called "The Trash Line" - see picture #12265, for a front-bumper version in action. Added by Pat Rivers-Bowerman on 14 December 2008. Hi Saully!What would the Safety elfs say about this? No BA on the the firemen on top of the skip! !Is that not a BIG NO-NO? Added by Anders Fallström on 23 September 2014.